Disclaimer: We’ve partnered with Frito-Lay in this sponsored campaign. What is the Legion of the Bold? After the immense success of Doritos’ “Crash The Super Bowl” video contest, the brand decided to take their consumer engagement to the next level. Thus, the Legion of the Bold was born. The Legion of the Bold is a creative community that empowers fans to create unique and inspiring content for the chance to earn brand recognition, have their work highlighted by a major brand and earn cash prizes to fuel their own personal creative interests. 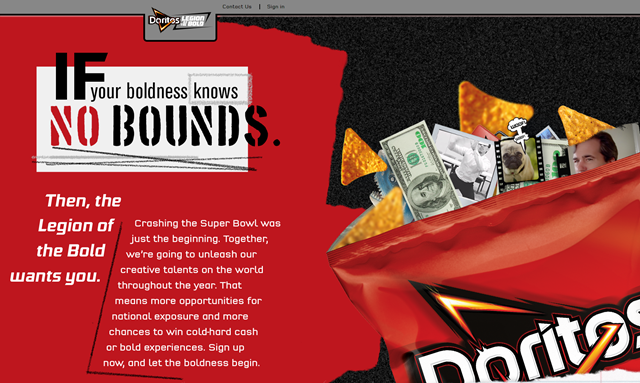 Doritos Legion of the Bold encourages open innovation and creativity among its list of highly creative members. More than a dozen “contests of skill” (briefs) have hit the community ranging from creating a “Love Ballad” to developing a script for an on-air spot to designing a fresh t-shirt design. The contests are uniquely designed to both challenge the creative community and push them to step out of their comfort zone. Anyone within the community can compete in each challenge regardless of their self-identified expertise. For example, a graphic designer could give a shot at writing copy for a social post. Top winners are compensated for their work, which allows them to support their creative interests. Win one of these contests for the opportunity to buy that brand-new set of acrylics or the latest stylus you have your eye on. What’s more, you could possibly see your amazing creation posted across Doritos’ thriving platforms. Seems like a fun challenge, right? Examples of Closed Contests: This Would Have Been Fun! In honor of Doritos 50th Anniversary, the Legion of the Bold was asked to create clever, creative and most of all, bold t-shirts. The winning design won $1000 and the honor of creating the boldest shirt ever. Doritos wanted to give Legion of the Bold members their 6 seconds of fame on Doritos® Vine feed and asked people to create a 6-second video that shows the world how Doritos® are bold, unexpected, exciting, or cool in your life. The winning Vine won $5000 and internet fame in Doritos Vine feed. The Legion of the Bold is looking for creatives like you. People who love the challenge of a blank sheet to come up with something enormous. Want to prove that you are the right one? 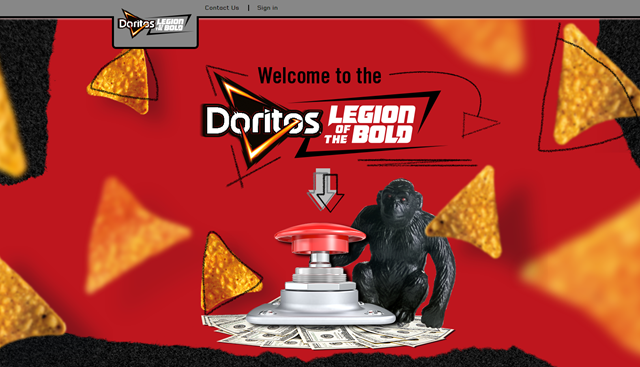 Go sign up for Doritos Legion of the Bold where you can create content for Frito-Lay brands, showcase your work and earn cash to fuel your own creative interests. Please note, content is not only for Doritos, it spans across the Frito-Lay portfolio. You are here: Home / Creatives Unite! Join the Legion of the Bold!